A new range of LED Video Walls designed as a replacement for traditional projector or LCD screen installations. LED provides stunning high resolution, high brightness, seamless content for advertising and digital cinema. 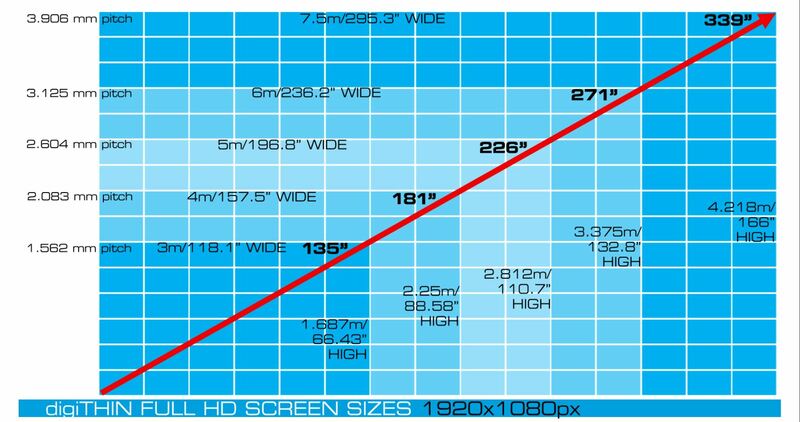 The digiTHIN range has been developed to meet the increasing demands of cinema screen markets with its dimensions simply matching 16:9 HD aspect ratio. The unbelievably thin chassis measuring just 52mm, makes it the ideal solution for discrete indoor installations where depth is a critical factor. In most circumstances LED will provide a brighter image, with better colour reproduction, increased contrast and a higher refresh rate than a LCD screen solution. The revolutionary universal LED screen system developed to meet the needs of resolution-hungry applications. digiTHIN is perfectly proportioned to 16:9 aspect ratio catering for simple setups of VESA standard resolution dimensions. The lightweight design allows digiTHIN cabinets to be directly fixed to a wall for efficient installations using traditional screw fixing methods. This helps reduce the cost compared to other LED tile solutions that use a heavy, bulky and expensive framework to hang the tiles on. To combat any fluctuations in the mounting surface, digiTHIN comes complete with built-in Z-axis adjusters. These consist of four telescopic devices in each corner to allow the cabinet to be mounted the appropriate distance away from the wall. The system can also use a slim, cost-effective aluminium profile if no suitable wall structure exists. To ensure a perfectly flat and seamless screen, the product’s cabinet is a precision machined cast aluminium structure, created and tested to high tolerance levels, so that when installed alongside each other, there is a mechanically perfect fit. This perfect Zaxis alignment is achieved with the help of an ingenious side-pin guide system that is machined to extreme dimensional accuracy. Appropriately-named, the slimline chassis measures just 52mm in depth – a fantastic indoor solution where space is a major factor with simple direct mounting on to walls and plasterboard surfaces. digiTHIN’s cast aluminium structure has been created and tested to extremely high tolerance levels ensuring there’s a mechanically perfect fit between neighbouring cabinets for a seamless screen. The LED tiles that form the front surface of the display are exactly located with magnetic fixings and allow effortless mountings on to the cabinet. There are no wires between the tile and the cabinet with the data and power being carried on ZIF (zero insert force) connectors, further simplifying installation. As soon as the LED tile locates into position, it instantly illuminates in true plug-and-play fashion. Fully accessible from the front, tiles can be removed easily for servicing and maintenance. 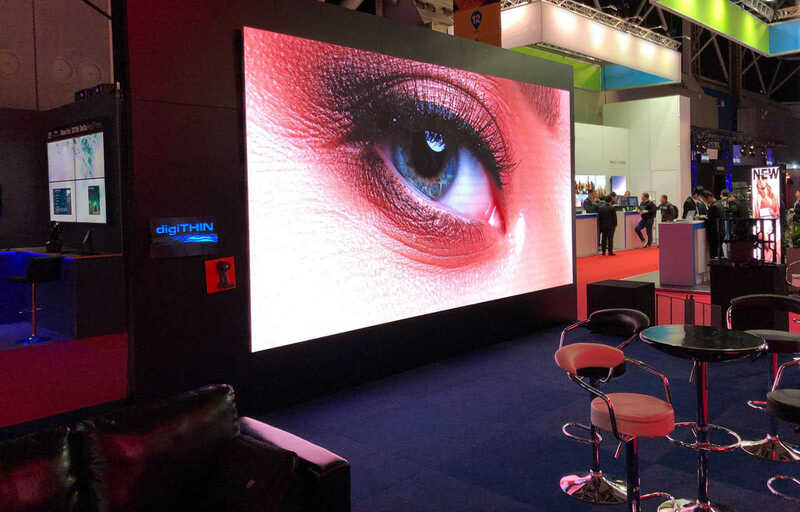 Long-term performance is a key concern of LED screen buyers so digiTHIN comes equipped with double the amount of power and data connectors required. A standby back-up path will automatically spring into life if needed, unnoticed by the human eye. Further fail-safe enhancements include options for fully automatic hot backup power supplies and scan cards, all monitored by the remote diagnostics system. Designed for projector replacement, digiTHIN allows simple fixed installations into indoor public areas such as retail environments, corporate settings, venues, television studios and the education market. For demanding applications like broadcast TV studios, digiTHIN components can be selected for optimum performance. Similarly, for digital signage, more cost-effective approaches can be used. You can of course create video walls at any size to create unique displays. Suggested viewing distances for these walls is 1000x the pitch. So the 3m wide wall at 1.5mm pitch can be viewed from a 1.5m distance at which point the individual pixels are not visible. Taking the largest example above you would need to stand at least 4m away from the 7.5m wide wall to get the best image quality from it. You can of course mix resolutions or create a UHD resolution 6m wall using 1.5mm pitch for high definition content. Please tell us what you want to use the video wall for, location, type of content etc. ?